GLORI Foundation is re-posting the publication and providing informal English translation of the initial paragraph — the original in Russian can be found at Lenta.ru website through this link. 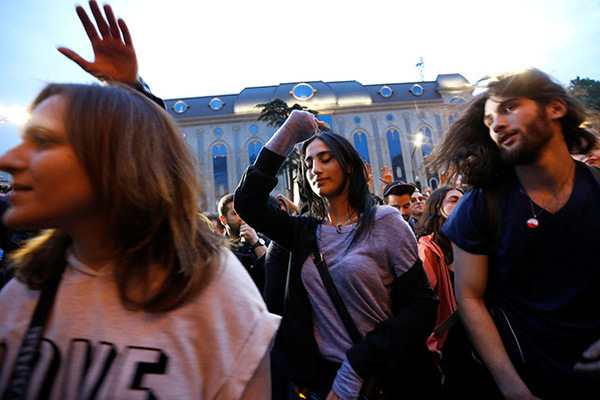 Members of the rave-protest at the building of the Parliament of Georgia decided to pause their actions until next Saturday. According to Beka Tzikarishvili who leads the White Noise movement, this pause will allow the Ministry of Interior to fulfill what they promised to the protesting people. Early morning on Monday the head of the Ministry of Interior, Georgiy Gakharia, met with them and apologized for what the policemen did while inspecting the night clubs in Tbilisi for drugs. Gakharia confirmed that he would lead the investigation of the policemen’s violations and collaboratively with the protesting people would initiate changes to the drug policy so that there were real outcomes. Liberal drug policy was among priorities in the election program of the ruling political party, “Georgian Dream — Democratic Georgia”. The mass protesting movements in Tbilisi in June 2017 that involved thousands of people, encouraged the authorities to start working on liberalizing the policy. However, this can be postponed due to the upcoming presidential elections. In this publication the Lenta.ru’s journalists are exploring political aspects associated with legalizing the drug policy in Georgia.